Are you stuck on something? Not sure how to proceed? Or are you hiding under the duvet, hoping things will pass over? You might find a way forward or a surprising solution if you declutter. Let’s face it, most of us simply have FAR TOO MUCH STUFF! In our homes, in our bodies, in our heads, in our lives. Our cupboards are stuffed, our drawers overflowing, the paperwork is piling up, and our wardrobes and closets… well, let’s not talk about those, ahem! The contents of our house were getting totally out of control a few years ago. What with two kids, both of us working and my husband being of the chaotic ilk, we let stuff pile up and didn’t deal with it. I was overwhelmed with having to deal with ALL THE THINGS for everyone else: arranging appointments, holidays and birthday parties, going to kids’ weekly afternoon activities, walking the dog twice a day, keeping in contact with family and friends, food shopping, meal planning, cooking, laundry, cleaning the house – the list felt endless. I had neither headspace nor time to deal with stuff, too. And even if I’d had, I wouldn’t have wanted to declutter it all on my own. It felt like a losing battle because my other family members would just dump their stuff on the floor where they were standing or on the nearest chair. They wouldn’t put things away (even if the things had a place to live and they knew where that place was). I increasingly felt uncomfortable and restless at home, not finding peace of an evening or at the weekend because I didn’t like my environment. It was too full, disorganised and “busy”. For example, I didn’t know where any important paperwork was – well, I knew it must be in that huge pile over there (or is it in one of those boxes in the cellar?) – and it caused me a lot of stress. I had a wardrobe full of clothes that didn’t match or didn’t fit. We had a ton of books we would never, ever look at again, that were collecting dust in our bookshelves. We owned hundreds of CDs but we never listened to them. The loft and cellar were STUFFED with unpleasant things from the past that we really just couldn’t face. They were no-go zones where we used the “quickly open the door, throw something in and swiftly shut it again” technique. Or we just groaned and immediately forgot about it again if we realised that something we were looking for “might be in the loft or the cellar”. And the kids’ rooms were bursting at the seams – URGH! Anyway, something snapped inside me and in my desperation, I started searching online for help. Thank Google that I finally found out how to declutter and organise our paperwork into a simple system that works! It’s been in place in our household since September 2015 and still functions well for us today! Also that year a close friend gave me a copy of The Life-Changing Magic of Tidying by Marie Kondo. It really helped me to declutter and organise my wardrobe, and declutter our books (even my husband saw the necessity and joined in!) It also still helps me to look at my stuff in a different way than before. Now, I often pick something up and ask myself, “Does this give me joy?” If not, out it goes! Another thing that really helped me organise my wardrobe was “having my colours done”. I went to a local Colour Consultant and found out I was “Spring”. I got my handy swatches of coloured fabric so that, when I’m out shopping, I know exactly what suits my skin and hair tones. I just ignore the rest and it makes shopping so much faster and easier. And now I have a lot fewer clothes and accessories in my wardrobe but everything matches and combines, so I feel like I have more outfits! A natural progression from decluttering my stuff was to declutter my finances. I went through a year’s worth of bank statements and cancelled anything that wasn’t serving us any more or that was unnecessary. I started automating a lot more things so that I could get it out of my head and not have to think about it anymore. I got us out of overdraft debt (and luckily we’ve never owned a credit card). Now, I regularly keep up to date with our finances and do what’s necessary for our financial health. No more head in the sand! Anyway, I feel A LOT better at home now that we’ve decluttered and organised most of our daily stuff and some of our irregular-use stuff too. Less stuff reduces the time used looking for and (mostly) not finding the important things. Being organised saves us money because we don’t just go out and buy another one of those things because we can’t find the one(s) we have. And ultimately, being decluttered and organised reduces stress because it’s easy to locate items. It takes minutes to tidy up because the cupboards are not over-stuffed and everything has a place to live. And we have peace of mind that our finances are decluttered, organised and regularly looked at. If you’re not dealing with the stuff so much, you have space to become unstuck. Room to grow. Light and air to breathe. Time to spend with people and on things that really matter. It is a gift in our crazy, busy, cluttered lives nowadays to enjoy simplicity and space. So, what would you like to spend more time on if you didn’t have to deal with all the stuff? 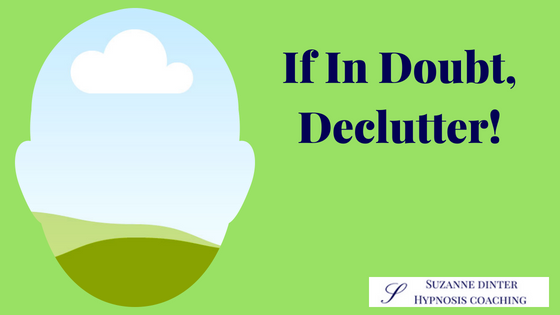 Do you feel like the stuff is not the problem, but you have too much stuff in your head and would like help decluttering some of that instead? Do you want to declutter old beliefs that you picked up from childhood that don’t serve you any more? Would you like to declutter an unwanted habit, replacing it with a new, empowering one? Or do you simply want help getting unstuck and finding your own way onwards and upwards? Please arrange a free, initial contact call with me here. If you feel inspired and just know I’m the one who can help you, please book a hypnosis coaching package here. 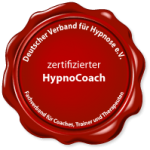 It costs EUR 449 and includes one free, initial contact call, three powerful hypnosis coaching sessions of up to 90 minutes each, and three personalised audio programming recordings. Find out how else you can work with me here. Hypnosis is one of the most powerful ways to become unstuck and decluttered! Thank you for reading my blog and I’m looking forward to serving you again soon. You'll also receive weekly gorgeous and inspirational content on all things hypnosis, self-mastery and self-development. I’m an online hypnosis coach whose mission it is to assist thousands of entrepreneurs and professionals to break free from unwanted habits, outdated beliefs and unhelpful childhood programming to become more successful, fulfilled and happy. I guide my clients in becoming much more in tune with their own needs and desires. I unlock unshakeable self-belief and calm, quiet confidence them. I'd love to help you do the same. What do you want to change? How would you like to be? How to use Harry Potter magic to protect you from negative people! Be careful what you say. Especially to yourself. Are you ready for your Big Leap?